Don’t forget to support your friends..
Hey everyone, I hope you are all well. I can’t believe that I haven’t written properly in such a long time. I never thought I’d be the inconsistent ‘blogger’, who takes long breaks between posts & then comes back with an apology. I’ve been struggling to write lately & the posts I have written, I just find them to be inadequate & I’m a real perfectionist. Uni has really been stressing me & taking up all of my time. Alongside working part time & running a Society at uni- it defo hasn’t been easy to find free time. That’s enough excuses though, I’m back with another one. Today’s topic is all about supporting your friends in their grind/hustle/passion/hobby. 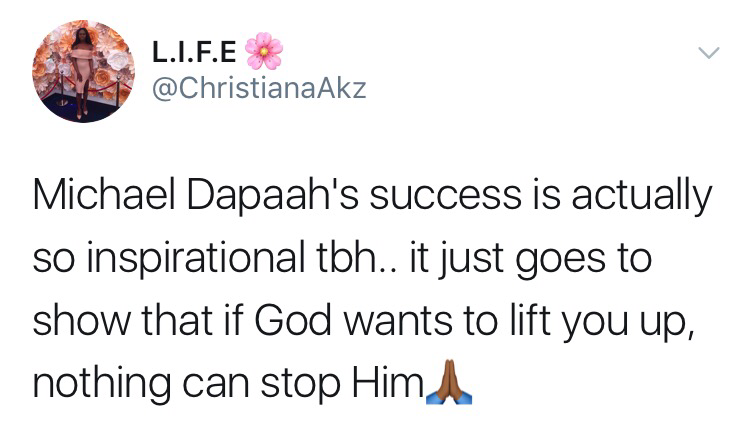 What actually inspired this blog post was Michael Dapaah. Unless you’ve been living under a rock, then I’m sure you would’ve heard of Big Shaq – Mans not Hot. It has been a hot topic for over a month now and the music video that was released a couple of days ago became the #1 trending video on YouTube, with 5 million views in just 2 days*. It’s actually so crazy how quickly he blew up, from small banter to actually becoming a big music artist internationally. The reason why Michael Dapaah’s success inspired this particular blog post is because it got me thinking about the amount of people that will now be saying ‘oh, I know him’ or ‘that’s my mate’. It is easy to say that now because he has become successful. But I wonder if these same people were sharing the link to his YouTube videos before and promoting it on their social media platforms. Do not wait until your friend is blowing up before you decide to support them. They will always remember who were there for them when they started off, and not those who only hopped on the bandwagon when there was some sort of buzz around them. Be a genuine support to your friend, especially in the stage where they are finding their feet. It will go a long way. Your support could be the difference between them carrying on or giving up. Sometimes you just need that reassurance that people are appreciating what you are doing. Invest in your friends as much as you can- if your friend is a hairdresser and you need your hair done; go and pay them for their services. Do not take advantage of them by asking for free services or a huge discount. Treat them like a professional business/service. How would you expect them to grow, if you’re constantly after freebies? If you’re feeling some type of way by this post- then I’m glad! I hope it makes you start supporting your friends in what they do. As I’ve said before, this is a generation of go-getters and I’m sure you will know a couple of people doing their thing. Take some time to actually seek an active interest in what they do, support it wholeheartedly. Even if only one person sees your support, that could potentially be another client for your friend and that would be down to you. We’re even lucky that social media is there, a simple retweet or repost can actually go a long way. On another note, I just wanted to say that by supporting others, it doesn’t take anything away from your success. With the Michael Dapaah situation I noticed some opinions online with people bitter as to the fact that there are ‘real artists’ out there who haven’t been as opportuned as Michael Dapaah. I see this way too often where people are under a false impression that someone else shining takes away from their shine. There is enough space for us all to win. If your friend is doing better than you at the moment, let that motivate you to double your work ethic. I feel like sometimes people are reluctant to support others aswell because they don’t want to come across as begs. Honestly, just forget what people say. You do good, people talk – you do bad, people talk. Support your people’s as if you’re supporting your own thing. Don’t just support because you’re thinking about what you will gain if they make it. Support your friends because their success is also your success. *It is currently at 14 million views!